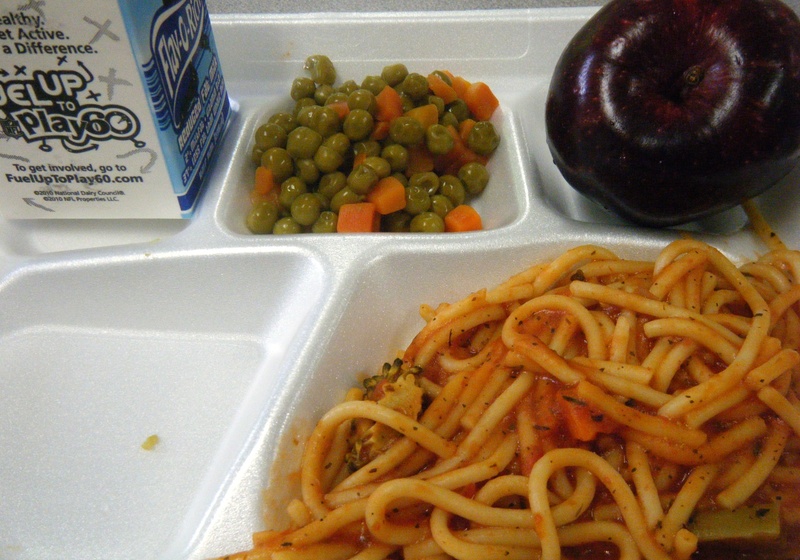 I’ve been hearing about efforts to improve lunch in public schools. So, when I had the opportunity to dine in a school cafeteria, I was prepared to be dazzled. I have to admit feeling underwhelmed. While the atmosphere and people involved all seem wonderful, the overall meal was a disappointment. If this is the best we can do for our children, we’re not making the grade. Here’s one mom’s effort at grading school lunch. Yes, you can choose a carton of conventional white milk. 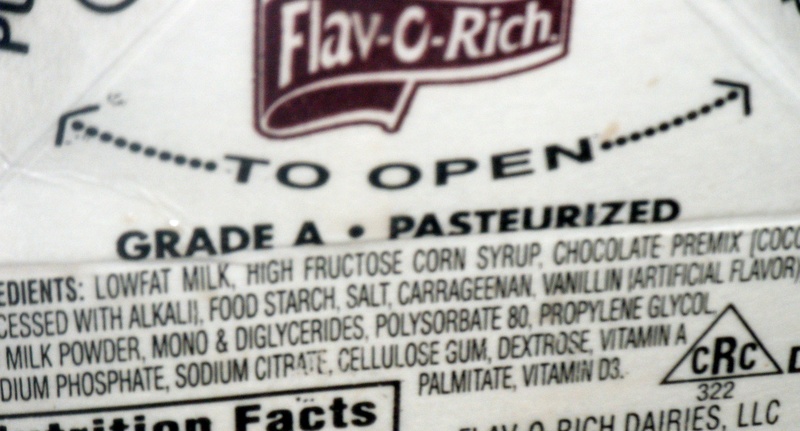 But the drink of choice with most students is clearly the chocolate milk, full of high fructose corn syrup, artificial flavoring and preservatives. Organic milk is not offered. Water does not seem to be offered as a drink choice, unless parents specifically request it. The bright spot seemed to be the choice of a fresh apple or orange with each meal. The mixed vegetables looked and tasted like the ones I remember from public school decades ago, when I thought peas were supposed to be shriveled, mushy, pale and tasteless. It appears that some effort was made to include a few small pieces of vegetable with the pasta, but the results were sparse. Out of three entree choices, only one appeared to have a hint of whole wheat in the bread. The pasta appeared white, as was the tortilla wrap. No evidence of any organic food being served, and not much fresh that might have been locally grown. A hint of a vegetable here and there was dominated by the overall blandness and appearance of processed food. The tomato sauces were watered down, although some effort was made to add herbs to the pasto combo. The cheese was tasty. Lunch was served on polystyrene trays, with plastic utensils, all to be thrown into a garbage can along with any leftover food. There was no evidence of any sort of recycling or composting effort. I did see brown, unbleached napkins being used. Friendly, attentive staff seemed to care about their jobs and the students. They seemed to keep the cafeteria clean and neat, doing their best with the resources available. 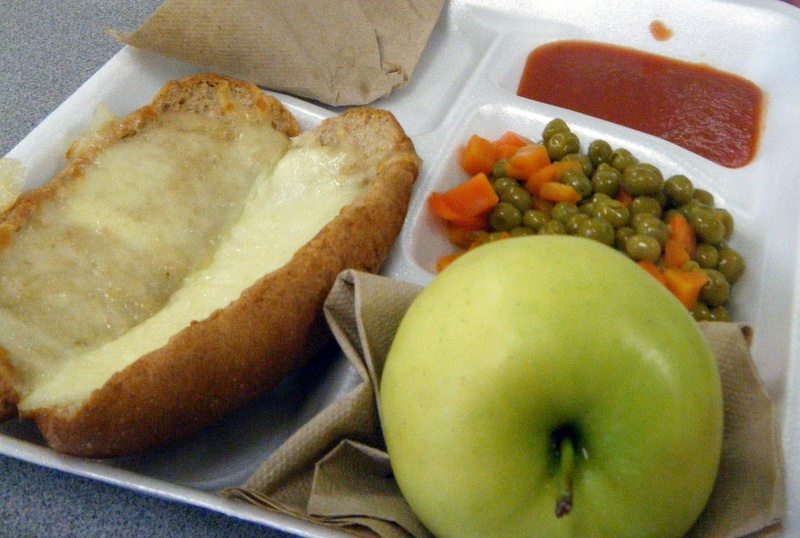 What do you think about school lunches these days? Does your child eat the hot meal or pack a lunch, and why did you make that decision? Constructive comments will be added below. Can We Live without Fast Food?